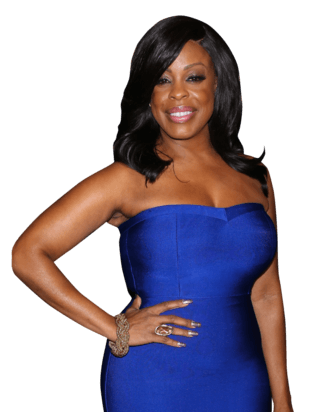 It’s easy to see why Denise Hemphill, the boisterous “Secure Enforcement Solutions” private security guard wonderfully portrayed by Niecy Nash, has become the breakout character of the campy comedy-horror series Scream Queens. Introduced in the second half of the pilot, Hemphill is hired to protect the not-so-nice sisters of Kappa Kappa Tau after the murderous Red Devil begins terrorizing the campus, and soon enough becomes the unintentionally hilarious “voice of reason” that’s often underutilized in today’s horror tropes. “You just said that you think the killer is up there, and that’s where you want to go? That’s insane! What you need to do is run out this door!” she tells the Kappas before they ascend a staircase in hot pursuit. Last week, we called up Nash, who’s concurrently starring in the third season of HBO’s Getting On (which earned her an Emmy nomination this year), to discuss Scream Queens, the lines she improvised, and why it’s important to laugh. What initially intrigued you when you read the scripts for Scream Queens? Well, here’s the thing. First of all, Ryan Murphy had me at hello. He told me that he had a role he thought I’d be great at, and I said, “Okay, I’ll do it.” And then I said, “Wait, what do I have to do?” So I said yes before I knew what it was. The thing when I first read the script that was interesting to me was that — and I said this to him in our first meeting — this was a comedy-horror. How are you going to do that? How was it going to be scary and funny at the same time? That was the thing that was so interesting — it was funny and campy and scary all at the same time. It was delicious. Not to mention the fact that as you’re reading it, doing those first few script reads, you know all of the people he cast in it. So you’re like, wow, this is really going to be interesting and fun. Did you find yourself creating a backstory for Denise? When I was first reading the scripts, to be perfectly honest with you, I was trying to find out whether or not Denise would be alive in the next episode. We were all grabbing the scripts and going down real fast, looking for our names. But I always thought, somewhere in the back of my mind, that Denise Hemphill and Raineesha Williams, who I played on Reno 911!, were related in some way. I just feel like they come from a long line of glamorous women in law enforcement. Denise was a woman who definitely takes her job seriously. So even though she’s funny and over-the-top, I always try to keep a certain brand in there. Something along the lines of, I know exactly what I’m talking about and I know that I’m right. Even if I’m wrong, I’m right. And that’s a character I’ve based on my mother, actually. Oh, lord, if you write that, I might not have anywhere to eat Thanksgiving dinner, but it’s true. After your law enforcement roles on Reno 911! and now Scream Queens, I feel the logical next step is True Detective season three to give it the breath of fresh air it needs. [Laughs] That could be very interesting. I hadn’t thought about that, but I’m open! I’m assuming the finale has wrapped production? We have done the finale, yes. Were your theories about the Red Devil correct? I had tons and tons of theories, and they were all completely wrong. And it’s so hard to keep up with [theories] on social media, too, honestly. But I will say – I love Scream Queens fans. They are unlike fans of any other show that I’ve been in. They are so engaged and invested, and I absolutely love it. How would you define the relationship between Denise and the Kappa sisters? I think that at this stage of the show she’s seen as a little more of an authority figure than previously. Before she was a little intrusive, but things shift once you have to live in a house with somebody. It’s now, “You’re going to do what I say” and all that. They now understand that she’s not going anywhere anytime soon. These girls just need a little much-needed tough love. Is there a sinister side to Denise that we haven’t seen, or is she solely meant to serve as that hilarious voice of reason? In my mind, I really do think that she’s the perfect voice of reason of the show. I don’t think that Denise has any sinister side. She puts the Chanels in their place, which is needed. Because mean girls, as everyone knows, can be vicious. Will we be seeing any onscreen Denise and Chad Radwell romantic escapades in the coming episodes? I can’t speak to that. But I will say that it’s possible. Anything is possible. Is there room for you to improvise on the show? Oh, yeah, I’m the one who improvises all the time. I think that was part of the reason I got this job in the first place. I’ll do a take and I’ll give you exactly what’s on the paper, and then after that it’s like, “Do whatever you want, do something different, do something else.” I can constantly push it. It’s interesting for me as an actress because I never know which take they’re going to end up using – I never know if this or that is going to actually make it into the show. Do you have a favorite line you’ve improvised that made the final cut? I’d probably have to say … it’s interesting because I try to give this character little hitters before she says certain things. Like, I’ll walk into a scene and say, “Hot damn, shazam! What’s going on in here? !” Or, “Boom shakalaka, that sure looks like blood!” I like adding these little notes to give it a little more of an impact. One of my favorite lines would have to probably be, very simply, “hashtag cahoots?” with a question mark. Even though when I’m out and about on the streets, everybody walks past me and goes, “Ooh, it smells like booty in here!” People must really like that line. Since this is an anthology series, and Ryan Murphy is famous for utilizing a core group of actors, has he approached you to discuss returning for season two? Yes, we have talked about that, and that’s a very viable possibility. One thing that is being hotly discussed about Scream Queens is Grace’s seemingly endless array of unflattering hats. [Laughs] You know, I think that every character has their own quirks. You have Chanel No. 3 in her really adorable and fluffy earmuffs. You have Denise Hemphill in way too much hair and makeup to be a security guard. You have Zayday in all of her tribal regalia. We all have a note that we hit because we’re all such extremes of ourselves, like extreme characters, or extreme characterizations of the women we’re playing. Do you think your sense of humor has changed as you’ve gotten older? Hm, no. I think my sense of humor finds the funny in just about everything. And now I think that I have a partner in crime, because my husband is exactly the same way. We’ll literally laugh from the time that we wake up in the morning all throughout the day. Whether it’s funny memes, whether it’s real jokes that we say on the phone, or even when we just make up random stuff on the spot. My mother says, “Why is it that every time I see y’all, you’re laughing?” I say, “Listen, we have so much fun and we share a very common sensibility on what we think is funny.” So I don’t think it’s changed, but I think that I now let it out more because my husband thinks the same way as I do. Why do you think it’s important to laugh? Oh, my goodness, have you turned on the news?! It’s rough out here in these streets. There are so many things that are happening in the world today, and if you solely focus on them, you’ll just become a negative person. I think that the old adage is true: Sometimes you have to laugh to keep from crying. I think laughter does do so much good, and I think that’s one of the reasons why I started looking a little bit younger, because I’m a lot happier and I laugh so much with my husband. It has rolled back the years a little bit. Screw the expensive face cream, just laugh as much as you can. Yeah. And drink expensive Champagne! Boom! There’s the formula.